On Thursday we learned that billionaire James Packer had broken up with that legend and icon and Queen of Las Vegas Mariah Carey less than a year after becoming engaged. There are rumors that they fought over Mariah’s extravagant spending. (What? She’s super rich.) There are rumors that Packer got cold feet. (From marrying Mariah Carey? Straight men are so interesting.) There are also rumors that Packer is violent and that Mariah broke up with him after a fight. But there’s another party involved in this breakup. I’ll give you a hint: they’re a VERY excited vowel. Yep, you guessed it, E! 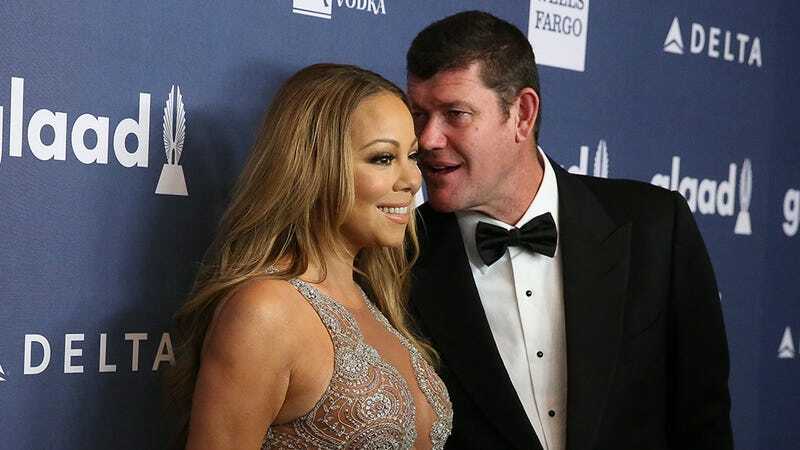 is reportedly “freaking out” over Carey and Packer’s split because of its potential for derailing their upcoming Carey-centric reality show, Mariah’s World. Though the public does, in fact, love a wedding, what many love even more is the schadenfreude of a nasty breakup. It also seems possible that E! would know that this latest development might bring viewers to the show, not deter them. I’d forgotten all about this reality show until news of their breakup was announced. And now here we are, a month out from its premiere. I’m not entirely sure how the interviewer was able to maintain composure here, but they deserve a Pulitzer for that alone. Jaime King’s son dressed as a mermaid and is freaking loving it.